Pyloric stenosis is the most common surgical disorder causing vomiting in infancy. Although the true cause of pyloric stenosis is unknown, it is believed to begin as the muscle at the bottom of the stomach becomes too thick. This muscle is called the pylorus. The enlarged pylorus blocks the passage of food from the stomach through the stomach into the downstream intestine, which results in forceful vomiting of formula or milk. Symptoms usually begin between 5 and 7 weeks of age, however some babies may have small amounts of vomiting before two weeks of age. Eventually the babies will vomit almost all feeds and continue to be hungry, even after vomiting. Some babies are able to hold down clear liquids without vomiting, but will continue vomiting once milk or formula is resumed. This repeated vomiting may cause infants to lose weight and become severely dehydrated. Age is an important factor in the diagnosis, as only infants can develop this type of pyloric stenosis. A history of persistent, often worsening vomiting in an infant is the most common symptom for pyloric stenosis. On physical exam, your surgeon may be able to feel a mass in the right upper abdomen which is the enlarged pyloric muscle. An abdominal ultrasound is used to measure the pyloric muscle and can determine if it is too large. If the ultrasound is unclear, a contrast x-ray test can be used called an upper GI study. This study will show a blocked stomach with a long narrow pyloric opening if the patient has pyloric stenosis. There are many causes of vomiting in infants, and overfeeding is the most common cause. A recent change in formula with resultant intolerance can also cause vomiting. Improved feeding technique and frequent burping and time are all that is needed for most of these problems to resolve. Other causes for vomiting include gastroesophageal reflux, pyloric muscle spasm and other rarer problems such as intestinal blockage. Severe medical conditions may also cause vomiting. If the vomiting is green (bilious), take your child to an emergency room immediately. Once the diagnosis is made, the child must be re-hydrated. Fluid and electrolytes by vein is the first step in treating infants with pyloric stenosis. It is very important to correct their dehydration and electrolyte abnormalities. Surgery is the treatment for pyloric stenosis. The operation occurs within a day of admission to the hospital, but will be delayed if the electrolytes are abnormal. Children are kept fasting for the period prior to surgery because of concerns about accidental vomiting during induction of anesthesia. Your baby will be asleep during the operation under general anesthesia. The operation, called a pyloromyotomy, can be performed through a variety of incisions. These include in the right upper abdomen, around the belly button, or using laparoscopy and very small incisions (laparoscopic pyloromyotomy). Regardless of the type on incision, the procedure is the same. 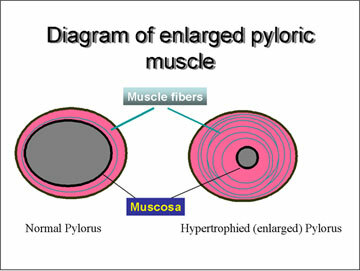 The enlarged outer layers of the pyloric muscle are cut to relieve the blockage. The surgeons at Pediatric Surgeons of Phoenix have abandoned the right upper abdomen incision because of the obvious scar. After the operation, fluids by vein are continued until the infant can take all of their normal feedings by mouth. Usually feeds are started 4 hours after surgery and the amount and concentration of feedings are gradually increased until full feeds are reached. Shortly after surgery it is common to see small amounts of vomiting until the baby’s stomach has completely recovered from the procedure. Most infants go home from the hospital within one or two days after surgery. The results of pyloromyotomy have been excellent and there is no increased risk of stomach or intestinal problems later in life. Complications following the operation are rare, but include bleeding, hernia, and infection. Very rarely, the initial operation does not resolve the vomiting and a reoperation is necessary. Even more rarely, the small intestine may develop a leak which can result in the infant becoming seriously ill. The risk of dying from the procedure is extremely small and is often related to other severe medical conditions. Pain control rarely requires more than over-the-counter pain relievers such as Children’s Tylenol or Children’s Advil. These may be given every four hours as needed at the dose recommended by your surgeon. Any other medications your child required before the operation should be continued on the regular schedule afterward. Your child may resume normal formula or breast feeding as before surgery. Always wash your hands before touching or cleaning the incision area. Some blood staining of the paper tapes on the incision is common. If the blood is dry and not spreading, the staining is not a problem. If the blood seems fresh, the amount is increasing, or if the paper tape is blood soaked and partially floating above the skin, apply gentle pressure with a clean washcloth for five to six minutes. If the bleeding does not stop after five minutes, call your surgeon at (602) 254-5561. The clear plastic dressing covering the incision may be removed 48 hours after the operation. No other dressing or band aid needs to be placed on the incision after this dressing is removed. A clinic appointment needs to be scheduled one to two weeks after the operation. Please call (602)-254-5561 to schedule this appointment.